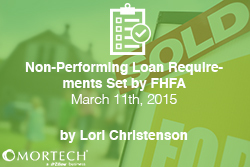 FHFA has set enhanced requirements for non-performing loans (NPLs) that the Enterprises (Fannie Mae and Freddie Mac) sell to the private sector. These enhanced requirements will reduce taxpayer risk as well as reduce Enterprise losses by transferring risk to the private sector. Last year and this year Freddie Mac had two pilot sales of NPLs that had a value of about one billion dollars in unpaid principal balances. These sales included loans that were severely delinquent (more than a year past due). The enhanced requirements focus on providing delinquent borrowers all options available to avoid foreclosure. These include evaluating borrowers for modifications, short sales, and deed-in-lieu of foreclosure with foreclosure being the last option available to servicers. Any properties that have gone through foreclosure and enter Real Estate Owned (REO) status should be sold to individuals who will occupy the property or to non-profits within the first 20 days the property is marketed. After that, sale to owner-occupants and non-profits is encouraged. Additional requirements include announcement of upcoming NPL sale offerings through outlets such as the Enterprise’s website, email distribution to small, non-profit and minority-and women-owned business investors, and outreach to potential bidders. There will also be loan resolution reporting and borrower outcome requirements for NPL buyers and servicers in order to monitor eligibility for future sales.